"Thomas Hardy." A brief introduction to Hardy, additional articles on Jude the Obscure , Far From the Madding Crowd , Tess of the D'Urbervilles , and more. Discovering Literature: Romantics and Victorians, British Library . "Thomas Hardy." Hardy's style, techniques, themes, and the cultural and historical context. Victorian Web, ed. Professor George Landow. "Thomas Hardy." An encyclopedia-type introduction to Hardy, includes a biography and a list of his works and a recommended reading list. Poetry Foundation . Brief introduction to Thomas Hardy from the Academy of American Poets . Thomas, Jane. A substantial introduction to Thomas Hardy from the Literary Encyclopedia , 17 July 2001 [subscription service]. Introduction to Thomas Hardy's war poetry, a study guide for undergraduates. Also A study guide for Thomas Hardy's poetry, which contains 2-3 paragraph discussions of the following poems: The Going of the Battery, Drummer Hodge, The Man He Killed, Channel Firing, In Time of The Breaking of Nations, The Going, The Haunter, The Voice, During Wind and Rain, The Darkling Thrush, Shut Out That Moon, To an Unborn Pauper Child, The Oxen, Afterwards. Universal Teacher, ed. Andrew Moore. Armstrong, Tim. A chapter from Haunted Hardy: Poetry, History, Memory (Palgrave 2000). Begins Armstrong, "Thomas Hardy's poetry, like his life, is full of secrets." Austin, Linda M. "Reading Depression in Hardy's Poems of 1912-13 ." On Hardy's Poems of 1912-13 as a sequential response to mourning. Victorian Poetry 36 (Spring 1998) [free at jstor]. Cohen, William A. "Faciality and Sensation in Hardy's The Return of the Native . PMLA 121, 2 (March 2006) pp 437-52 [free at jstor]. Dessner, Lawrence Jay. "Space, Time, and Coincidence in Hardy." Studies in the Novel 24, 2 (Summer 1992) pp 154-72 [free at jstor]. Grossman, Julie. "Thomas Hardy and the Role of Observer." Discusses Hardy's narrative technique. ELH 356, 3 (Autumn 1989) pp 619-38 [free at jstor]. Jacobson, Dan. 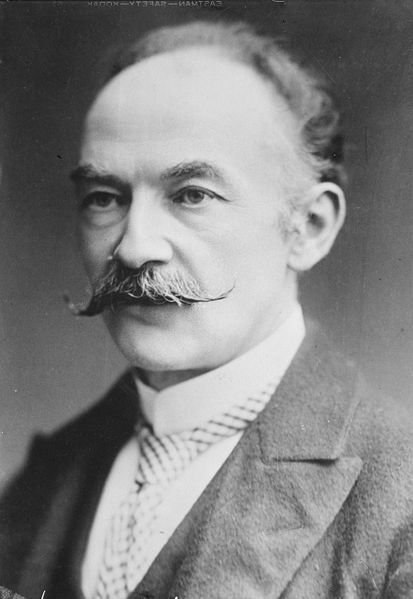 "Thomas Hardy: The Poet as Philosopher." The American Scholar 65, 1 (Winter 1996) pp 114-18 [free at jstor]. Jones, Lawrence. "George Eliot and Pastoral Tragicomedy in Hardy's Far from the Madding Crowd ." Studies in Philology 77, 4 (Autumn 1980), pp 402-25 [free at jstor]. Kreilkamp, Ivan. "Pitying the Sheep in Far from the Madding Crowd . Novel: A Forum on Fiction , Fall 2009 [abstract only]. Langland, Elizabeth. "A Perspective of One's Own: Thomas Hardy and the Elusive Sue Bridehead" [in Jude the Obscure ]. Studies in the Novel 12, 1 (Spring 1980) pp 12-28 [free at jstor]. Longo, Mary Ann Tighe. "Dysfunctional families and determinism in the fiction of Thomas Hardy." Dissertation, 1993, U of Nebraska. Lincoln. Lowe, Brigid. "Thomas Hardy, Tess of the D'Urbervilles (1891)." Victorian Review 635, 1 (Spring 2009) pp 56-60 [free at jstor]. Miller, Susan M. "Thomas Hardy and the Impersonal Lyric." Journal of Modern Literature 30, 3 (Spring 2007) pp 95-115 [free at jstor]. Shumaker, Jeanette Roberts Abjection and degeneration in Thomas Hardy's "Barbara of the House of Grebe." College Literature , 26, 2 (Spring 1999) [preview or purchase, jstor].